The dig from the top of the spoil heap. UHI undergrads get to grips with the joys of planning. Today at the Ness started bright and sunny, but with a distinctly nervy feeling in the air. The reason lay quietly in the trench, just outside Structure Twelve. Jo’s huge slab of decorated pot, as mentioned here for the past two days, was facing “L-for-lifting” day. This was not an easy task. When discovered, a couple of days ago, the pot was uncomfortably plastic. Drying in the air had clearly helped its structure to firm up a lot, but there was a strong possibility that it would break into many pieces. The usual hi-tech aids were deployed – such as a cake slice, bandages, metal plates and parcel tape – and, to everyone’s relief, the pot was lifted substantially intact. The crucial decorated area was particularly well preserved, but the pot had only just been tucked away safely in the finds hut when more pottery began to emerge. Professor Mark Edmonds reveals more of the inner wall of Structure Ten, under robbing debris. A few metres away, in Structure Twelve, work continued in exploring the robber trench. It seemed most likely that the south-east pier had been hauled away by the stone robbers, but, surprisingly, the basal course of the pier were found to be still in place. It matches exactly the pier on the south-west side of the structure. In the new extension to Structure Fourteen, the UHI students have been getting to grips with the intricacies of planning. 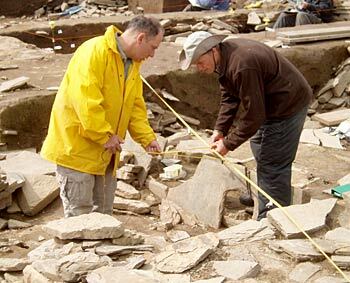 This is not necessarily the easiest of tasks on an archaeological site. A strong back, a good eye and an ability to concentrate hard in any weather conditions are an essential prerequisite for planners and not everyone finds it the most delightful of tasks. Ray reveals in the remnants of the south-east pier of Structure Twelve. The UHI students have, however, turned out to be excellent planners and the supervisors are delighted with the quality of their work. Georgie, another UHI student, but this time on a Masters course, worked long and hard in Structure Seven last year without finding anything. To the amazement of Nick, the site director, she volunteered again for Structure Seven but this time her dedication has been rewarded. She emerged from the middle of the structure today clutching a beautiful flint scraper. The only problem will be persuading her to part with it. In Structure Eight, Professor Scott Pike, and his student Jordan, have prepared for XRF sampling tomorrow. Professor Scott Pike and his assistant, Jordan, laying out the grid in Structure Eight for XRF sampling. This process, which will be carried out on the floor deposits, will give vital information on the chemical signals contained within the floor. This will, in turn, give an indication of what types of activity or processes were taking place in the different areas within the structure. Hopefully, the weather will stay dry for this complicated procedure. 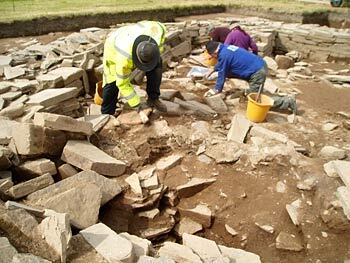 In the north-western corner of the site, to the west of Structure One, excavation has now revealed a definite curving wall, which may represent yet another structure but one which, unfortunately, is likely to be located under our very large spoil heap. And last, but by no means least, one of the most surprising finds of the day came from Structure Ten. 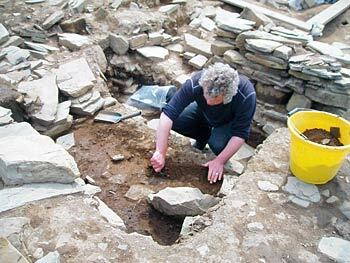 It is not unusual to find pot lids – those carefully crafted discs of stone – on archaeological sites on Orkney. They are usually rather small, perhaps the span of the palm of a hand, but Mike struggled out of Structure Ten yesterday with the biggest pot lid most of us have seen. It is fully 35 cms in diameter and has been trimmed to shape with real care. 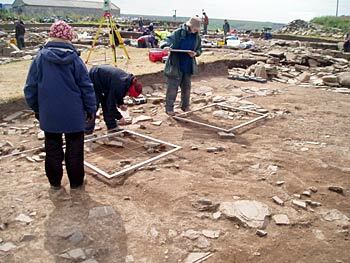 Like all the pot lids discovered thus far on the Ness site, it has no signs of being affected by the heat of a fire. Most probably this indicates use on a large storage jar or perhaps a more esoteric use. Tomorrow is the last day of the digging week and diggers usually find an extra spurt of energy on a Friday. In case anyone thought we had forgotten about the weather, we hope fervently that it will be fine. The covers come off for ‘play’ to be resumed. My name is Murray and I’ve just finished my first year of the BA degree in archaeology at the UHI. 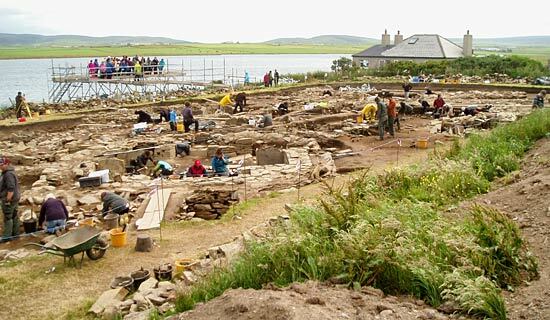 This is my first year digging at the Ness of Brodgar. The site itself is bigger than I expected it to be, even from looking at pictures and plans. It’s only when you’re moving about the structures that you really get a sense of their scale and their setting in the landscape. What really struck me about the site here at the Ness is just how open and exposed it is; when the weather decides it wants to behave then it’s quite serene and peaceful, but on days like this when the wind is gusting strongly, it’s a tough place to be. For the past week and a half, I’ve been working mostly in the new extension, Structure Fourteen. My finds so far have been a mixture of burnt bone, pottery and stone tools. The guys working around me have also been quite successful unearthing finds, so yesterday I spent some time on the total station, inputting the finds locations. It looks like an easy job but it’s actually quite demanding, especially when there is a freezing wind blowing and you have to type in details for every single find! By the end of the day, my fingers felt pretty numb! Today, along with help from Catherine and Dan, I set up the total station ready for use, and, after that, I started to plan sections of Structure Fourteen. It can be awkward balancing the drawing board while stretching over the frame and dropping the plumb bob into place, but it’s also rewarding when you move the frame and find that your sections line up and start to form an overhead view of the area. It’s nearing the end of my second week here at the Ness and it has been fantastic to watch Structure Fourteen slowly emerge from beneath the topsoil. 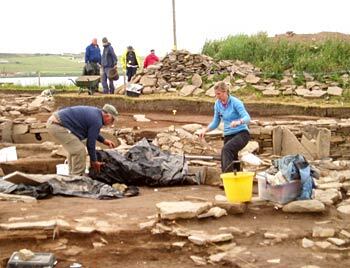 There is still a lot to go though, and, although I’m here for the whole six weeks of the dig this year, I really feel that I’ve learned some essential skills that will come in more than handy in the future. Being such a unique site I’m looking forward to learning as much as I can, even if the weather is less than summery most of the time!